Two weeks is all she had. Two weeks to transition from a role as the starting goalkeeper of a high school team to the starting goalkeeper of one of the best teams in the country. 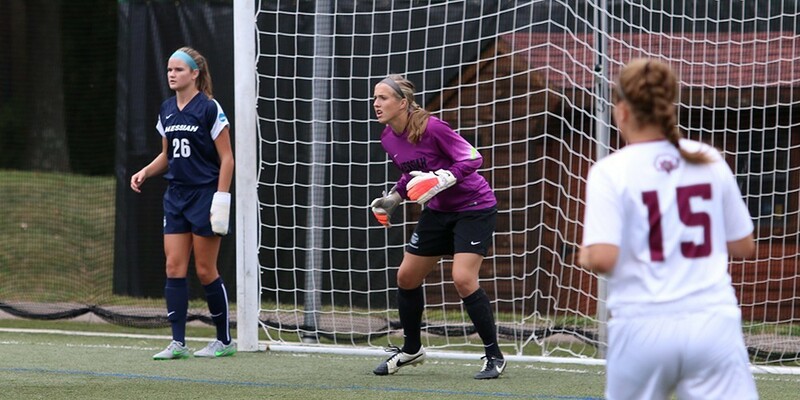 Shutouts were on her mind, as the previous goalies at Messiah were known for them. She would never imagine a few short years later, she would set an NCAA record for most career shutouts in Division I, II, and III men’s and women’s soccer. Even before senior starting goalkeeper Audra Larson would step on to Shoemaker for the first time, she would have to step into the big shoes left behind by former Messiah superstar and alum Autumn Reilly, who left with 54 career shutouts. Larson was definitely intimidated, but was transparent about her freshman year experience. Coach Eric White quickly stepped in to the mentor role for Larson, and has remained present for her entire collegiate career. “To be honest, Coach White deserves the credit to developing her in the one of the best keepers in Division III right now,” said head coach Scott Frey. Whatever fears or issues of confidence that Larson had dissipated over the course of the season as Larson went on to set the national record for shut-outs in a season with 22 and a national championship. The earlier doubts she had about faith were erased as well. “I’ve accepted Jesus into my life, and it’s been awesome to see how He’s been changing me as a person through being on the team,” said Larson. Teammate and fellow senior Macaulay Soto said Larson still wanted to raise the standard for herself, despite coming off being a national championship. Other college athletes may want be content with taking it easy because they ended the season on top. The opposite is true for Larson. “She’s never satisfied with where she’s at, and that is evident in her work ethic. I have never seen someone work as hard as she does,” said Soto. Soto also added when the team runs the 2200, Larson is always in the ‘fast group’. Soto would be among the first to tell you that Larson is a definite leader on the team, but her dedication to improving her physical wellness is a big part of how she leads by example. Larson wants to be as fit as the forwards on the team, if not more than. That’s rare on any team, and it doesn’t go unnoticed. Soto said, “Audra is the voice of our team.” Larson surveys the entirety of the field and is able to call out players that are slipping behind the defense or lanes to attack. Larson said, “The team realizes that we are playing for something much bigger than themselves, and that we are playing for His glory,” not their own personal motives or hopes of accomplishments. Setting the record for career shutouts is quite significant, especially considering Larson’s record spans all three NCAA athletic divisions and male and female teams. The athlete she surpassed, Chelseas Parise of Grand St. Valley, achieved the record over 101 career matches, Larson has done so in 82, with plenty of matches left in her senior year. It’s an incredible feat, but the last thing she would do is say that it was all her. “I would be nothing without the ten girls in front of me on the field. They are the reason that I have had so much success, and I love playing with them,” said Larson. The season is still young, and anything could happen. Larson emphasized that this team has a mission this year and they are all on the same page. This has translated to their play, and their record is the proof. For Larson, it’s not so much about individual shutouts in games, but shutting out the distractions around her and focusing on Jesus Christ and letting it translate to her play.